The BC Northern Real Estate Board is bounded on the north by the 60th parallel from Alberta border on the east to the international border with Alaska on the west including the Queen Charlotte Islands, and then south to Cape Caution on the 51st parallel. The Boundary then follows a north-easterly route to just west of 100 Mile House, south to below 70 Mile House, and then it proceeds north-easterly again to take in the areas of Bridge Lake, Mahood Falls, skirting the Wells Gray National Park to an area south of the North Thompson River on the Alberta border to the 55th parallel where it intersects the boundary with the Northern Lights Real Estate Board, then proceeds in a north-westerly direction to the Bennett Dam and then east along the Peace River to the Alberta border and northward to the 60th parallel. 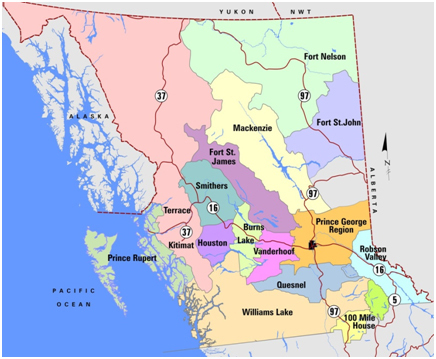 Major communities include: 100 Mile House, Williams Lake, Prince George, Fort St. John, Smithers, Terrace, Kitimat, Prince Rupert, Fort Nelson, Mackenzie and Quesnel.